Budapest is a remarkable city, much bigger than I was expecting and with an exciting vibe about it. I really should do more research before I get somewhere (rather than just a quick read-through of Wikitravel whilst I’m on the train). My apartment is on Kavinsky street, which is in the Jewish district. It is, I am told, dead trendy now. It is strange how these areas suddenly become fashionable. Opposite my apartment is a famous ‘ruin pub’. 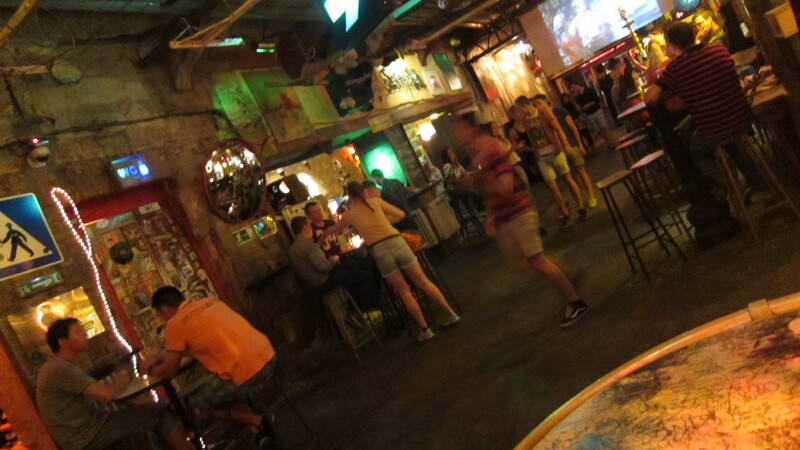 The name is Szimpla Kert (or ‘simple garden’). Ruin pubs have sprung up in Budapest in the past few years, taking over an old warehouse or other unused space, decorating it with an eclectic mix of things rummaged from old houses and closed-down factories, and opening it as a bar. Often, as with this one, it is much more than a bar and there is also live music, cabaret and all kinds of things going on there. 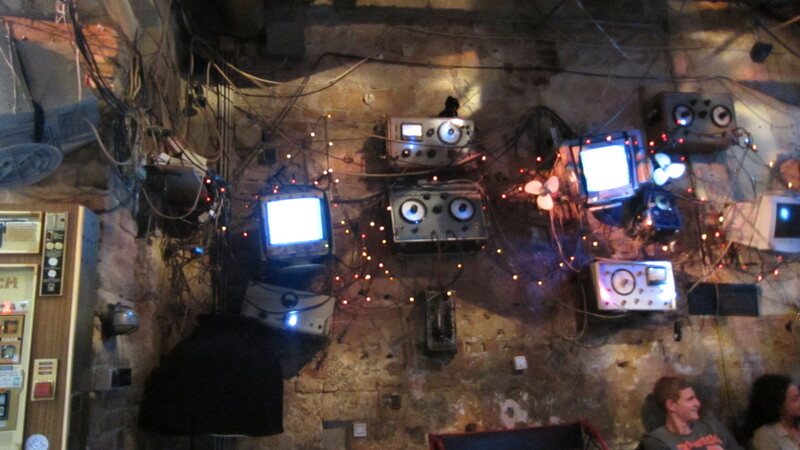 Szimpla kert has a film festival and open air cinema too. Lonely planet voted this the third best bar in the world in 2012 and so I felt duty-bound to go in and see for myself. Lonely Planet number one bar is also in Budapest, but in another part of the city and I am very lazy. Actually, it’s not so much laziness but rather that I’m not so much of a bar-bunny these days and so don’t tend to go seeking out places to drink. Rather, I let them come to me. The décor alone here could keep me occupied for days, just poking around and looking at stuff. 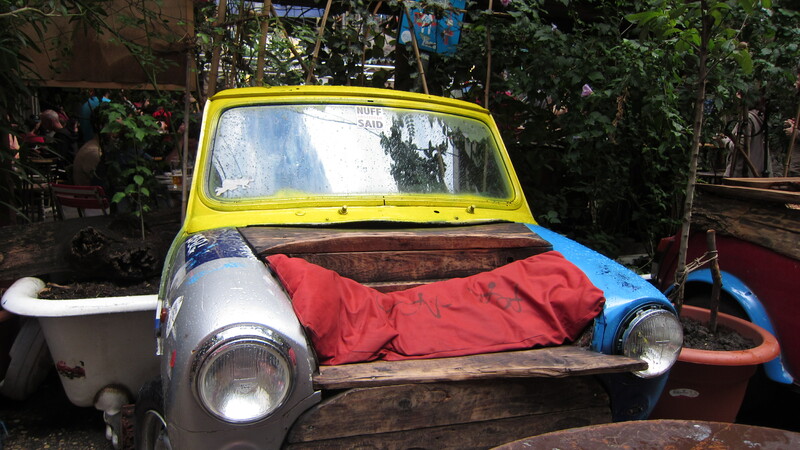 It includes this car that has been converted into a seating area. I am rather tempted to decorate my own flat like this, although since I’m planning to rent it out for a while at the end of the year I’m afraid it would hinder me too much and I’d have to limit myself to only ‘hipsters’ as tenants. Ah well; I’ll just have to enjoy it whilst I’m here.